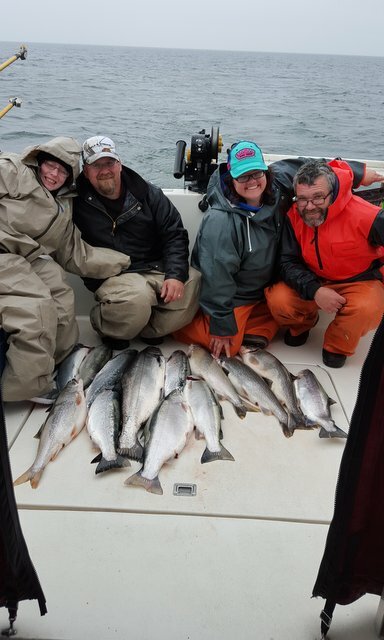 On the morning of April 23, fishing with a crew willing to hunt for king salmon, the first adult chromer of the 2018 season came aboard the Fish Doctor. More early spring kings will follow because we fish for them. Yes, a few boats catch an occasional early spring king while targeting other species, mostly browns this time of year. But, if you want to catch any number of kings you have to fish for them. Although the mother lode may not arrive for a while, there are always some kings around in late April. Until kings begin to stage and forget about feeding in favor of spawning, kings are looking for only two thing, to be comfortable in suitable temperagture and to keep their bellies full. After spending the winter in 39.7 degree water in the midlake depths chowing down on alewives, kings are comfortable anywhere in Lake Ontario right now from the shallows to midlake, surface to bottom. Yes, a few kings are caught in shallow water near shore, but if you’re looking for numbers, look deeper. It’s just a behavior thing. Feeding kings need food, in the case of Lake Ontario, alewives. Find alewives and you’ll find kings, whether it’s April or July. Early spring kings are easy to catch when you find them. The best place to find them…, off the mouths of the two largest tributaries in Lake Ontario, the Niagara and the Oswego Rivers, PERIOD! The same techniques that catch kings later in the season catch them now, as long as you fish the temp where they’re comfortable. Fish for them on the surface right now with the right stickbaits spoons and they will hit them. Dodgers and flies are another early spring Fish Doctor favorite. The bottom line…, you have to fish for them to catch them. The Fish Doctor, moored at dock #21, Oswego Marina. If you’ve got a hankering to do some spring brown trout fishing, now is the time and Oswego is the place. 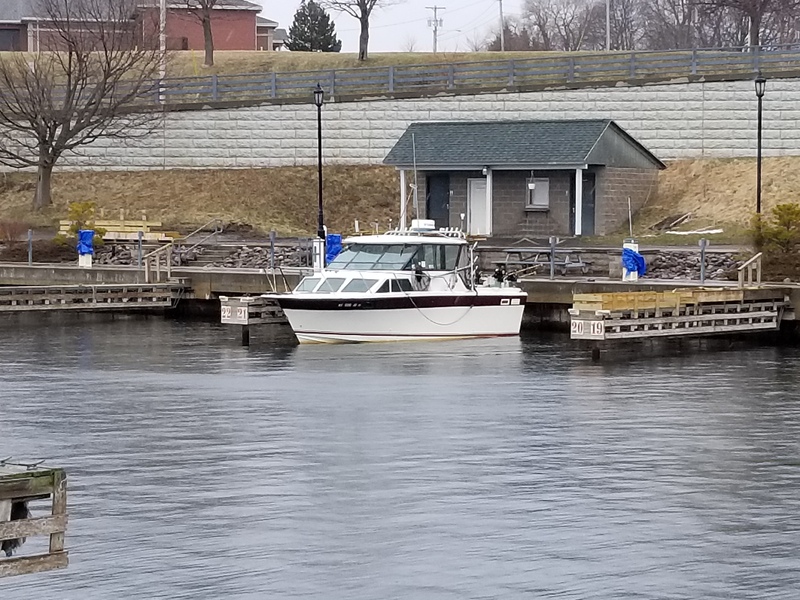 Water temperature in Oswego Harbor was near 40 degrees the past few days and there are plenty of browns in the harbor and to the east of it. There are also some lakers stacked up on bottom in 120 fow and deeper. Along with the browns in shallow water near shore, occasional domestic rainbows are showing up. Haven’t seen or heard of any spring cohos being caught, but there have to be a few around. Good numbers of 2-year olds are being reported, along with 3-year old and older fish. Check out the attached pic of one of the browns boated on the Fish Doctor on April 13. The browns, even in early spring, can be a bit selective. It didn’t take long a few days ago that the browns told us they wanted Stingers and 3″ stickbaits in black/silver/orange. Fussy buggars! Weather has been an issue for sure, keeping us off the lake on April 14, 15, and, from the looks, well into the coming week. When things finally settle down, spring fishing should be good. 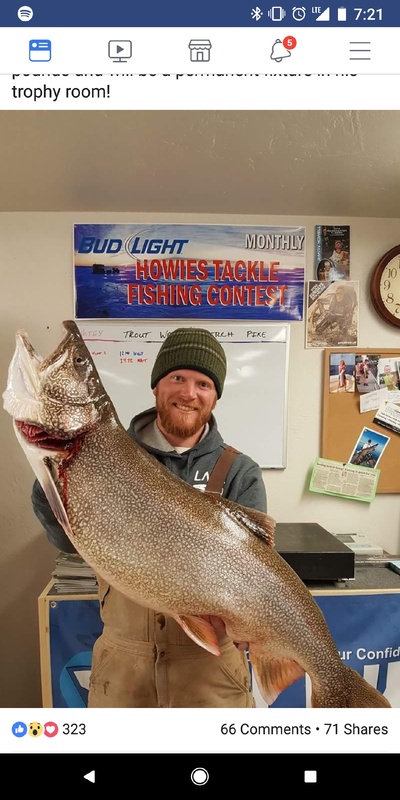 This jumbo laker was boated on April 9, 2018, in Sturgeon Bay(Lake Michigan) while trolling shallow water for browns. 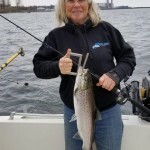 It’s that time of year when you’ll see many Lake Ontario anglers on the water trolling for brown trout in shallow water. Along with the browns, they will catch occasional cohos, domestic rainbows, Atlantics, and lake trout. Most of these other trout and salmon species are caught incidental to browns, without targeting them. However, while fishing shallow, inshore water, anglers can target these other species, including lake trout. Lakers behave differently than browns and like a different trolling presentation. When folks aboard my charter boat, the Fish Doctor, are interested in catching a few shallow water lakers along with browns, we target them with one or two lines. To do this, I run at least one rigger tight to bottom with a larger spoon than I would typically fish for browns. That spoon also has a bit more color in it, be it paint or tape, than a spoon I would select for brown trout. Ditto, for targeting lakers with planer board lines…, a larger, deeper diving plug will catch more lakers for you. Storm’s Thin Fin is one of my favorites for what my Maine customers call togue. 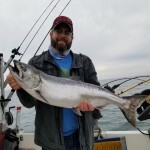 So, you’ve heard about the unbelievable fishing in Lake Ontario for king salmon up to well over 30 lbs., plus brown trout, steelhead, and lake trout all reaching weights of over 20 lbs. You’ve decided you’re going to book a charter on this 200 mile long by 50 mile wide inland ocean in 2015. Early Spring – The minute anglers get on the water in late March and early April they’re catching trout and salmon, mostly cohos. Although every port along NYS’s coastline produces cohos in early spring, the west lake is the best bet for “silvers” in May and Jun. If you’re looking for spring king salmon, wait until after the first of May and fish from Oswego west. 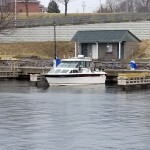 Because of the heavy spring flows of sun warmed water from the Oswego River, the port of Oswego usually produces king salmon fishing in May when Fish Doctor anglers have put as many as 201 May kings in the cooler in 31 trips . However, spring salmon fishing out of Owego is not as consistent as in the western end of the lake. For spring brown trout, three of the very best Lake Ontario ports are Oswego, Fair Haven, and Sodus, where charter captains target Lake Ontario’s world class “football” browns. 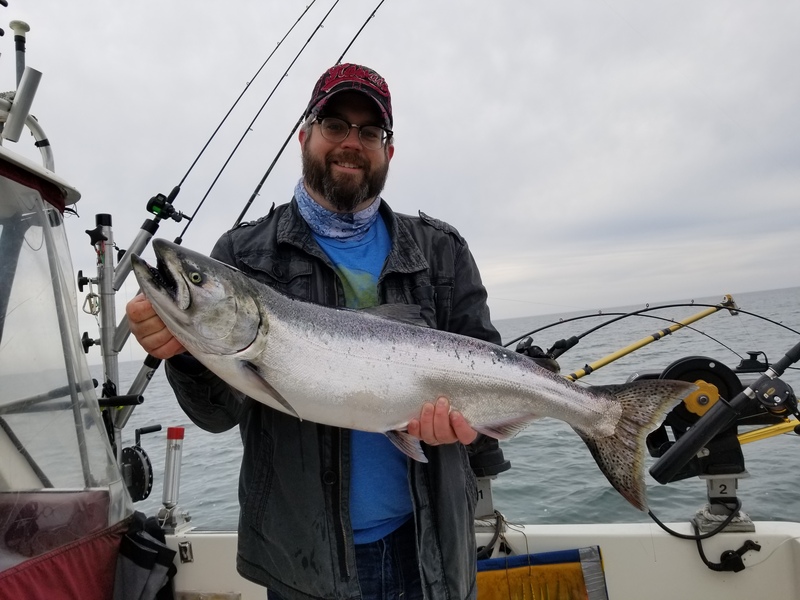 Spring Transition – By June, king salmon are scattered lakewide fishing in out of the port of Oswego is revving up as kings follow spawning alewives inshore. Offshore steelhead fishing starts to heat up in June, as nearshore surface temperature warms. Some years, like 2014, when conditions are right, steelhead fishing in late spring is fantastic. 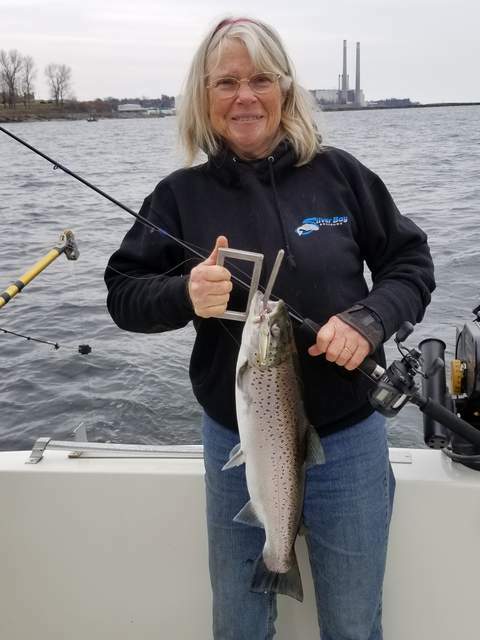 June also produces some of the best fishing of the season for tropy brown trout, east of Oswego Harbor where two out of the three recent 30+ lb. New York State record browns were boated. 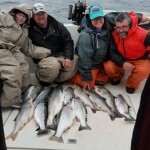 Midsummer – In July and August, every Lake Ontario port along New York’s 360 mile long coastline, including Oswego, produces good salmon and trout fishing. The big difference among ports by early August…, tens of thousands of king and coho salmon beginning to stage in the southeast corner of the lake, as they prepare to spawn in the Salmon River, the Lake Ontario tributary with the heaviest salmon stocking and the greatest production of wild king salmon. This is when anglers flock to the port of Oswego. Early Autumn – In late August and September, stocked and wild salmon are returning to their rearing streams, and all New York’s Lake Ontario ports produce salmon fishing. Again, though, the largest concentration by far, of king and coho salmon is in Mexico Bay in the southeast corner of the lake, making ports like Mexico Point and the Salmon River early autumn hotspots. That’s why you’ll find the Fish Doctor moored in the Lower Little Salmon River just upstream from Mexico Point, from midAugust through the end of September, at the front door to Mexico Bay, minutes away from , more staging adult king and coho salmon than anywhere else in Lake Ontario.